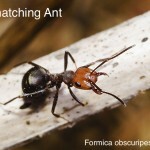 Odorous house ants are small black ants often found in kitchens and bathrooms in early spring. They feed on a wide variety of foods but seem to be especially attracted to sweet things. When crushed they emit a distinct odour (like rotten coconuts) which can help to identify them. Colonies can be very large and usually contain several nesting sites. Nests are frequently in wall or ceiling voids and can be outside under stones, firewood piles or under building foundations. 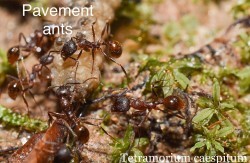 Odorous ants follow each other in distinct foraging trails so can be easily tracked. If the ants are routinely foraging indoors and no action is taken, they will likely recur in subsequent years. 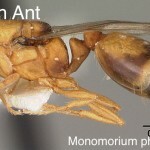 As their name suggests, pavement ants usually make their homes under sidewalks and driveways, building slabs and large rocks.In early spring, colonies attempt to conquer new areas and often attack nearby enemy colonies. These result in huge sidewalk battles! A telltale sign that you might have pavement ants, other than seeing the ants themselves, is the sand or dirt piles they tend to push out of the cracks and crevices they nest in. It is common to see these piles in brick driveways and interlocking paving slabs. Pavement ants are dark brown in colour and measure 2.5 – 4 mm in length.Pavement ants will eat almost anything, including insects, seeds, honeydew, honey, bread, meats, nuts, ice cream and cheese. There are many different species of Thatching ant in British Columbia. Several are red and black, while others are all black. 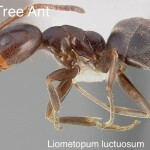 Worker ants range in size from 3 – 9mm in length depending on species. 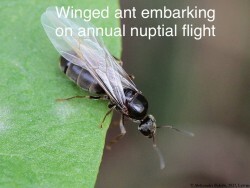 Winged male ants look identical to winged male carpenter ants. 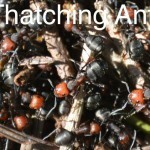 The common species of thatching ants nest in rotting wood and the surrounding soil. Occasionally satellite nests are built in wall voids, attics and other parts of buildings. It I usually easy to find, and follow, thatching ants to their feeding sites and nest sites during daylight hours. 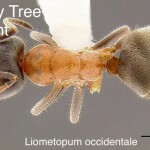 There can be several queens in the colonies and colonies can contain many thousands of workers. 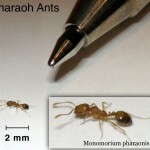 Pharaoh ants are very tiny (about 1/16″ in length) and yellowish to light brown in colour. They prefer warm moist conditions and frequent areas of high bacterial concentrations and are found in kitchen and bathroom cupboards, on counters and on the floors. They will go after any exposed foods for example, pet food, spilt food in cupboards or any food that collects behind major appliances. Pharaoh ants are among the most difficult pests to control and colonies can contain up to 300,000 individuals and several queens. 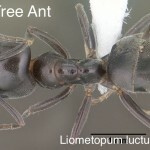 Need help with Ant Control in the Okanagan Valley?